I didn’t manage to change the 4th one as it’s the only one held in by a bracket... well the bolts and nuts are 17yrs old and we’re not budging!! If you manage to find a place that supplies the bracket holding the last hanger, let me know mate. Mine is bent and twisted to hell as I had the same problem and set about beating the crap out of it until the nut gave up! Don’t suppose you supply a replacement part Alyn? Or fabricate ones? Well bracket kit has now been ordered from the USA. As weather is nice this weekend if I am feeling brave I might tackle the u-cradle refurb.........................if I’m feeling brave. Now am I brave enough to try and grind the old one off! Are you going to give it a decent coat of paint before you fit it? Least you can crack on with it..
How are you guys uploading pics now ? Madness isn't it - I ordered a new cupholder for mine from the states - took 5 days but £20 cheaper than I could get it in the Uk! Nobody could even supply these in the U.K. ! Crazy indeed! It is mad, so did subaru not able to get hold of them? Well what a faff that was! Passenger side - not so straight! Has someone jacked it up in the wrong place? Has someone jacked it up on the lower arm? See! I can’t even be trusted to jack a car up! Glad you sorted this issue, and found the other before your ring trip. Top tip always jack the rear diff up on the scoob easy and safest place I find. Can u tell I have all the gear and no idea? Pmsl!! This is why Mr Rob and Super Jules work on my car and I just make the tea! Well little job done this morning. Tegiwa brake stopper fitted - although not the 20min job it reckoned!! Had to remove induction cone, and boost solenoid bracket to get proper access and then the holes didn’t quite line up so a bit of force needed to line everything up whilst screwing.. meant the stopper “red button” wasn’t sitting quite squarely and so screwing that in was very awkward as it wasn’t going straight with the thread but it’s on! Looking good, a mod I keep meaning to looking into. Guess you will know when you press hard form speed. It's quite scary how much the bulkhead flexes when you push hard on the brake pedal, I noticed it when I was bleeding the brakes on mine. I keep looking at them and they're all blue and I can't be doing with spraying it before I fit it. With all this hard work you are putting in I look to you forward. Yeah right! No chance of that mate..
Last edited by Rdlangy1; 13-04-2019 at 06:07 PM. Don't doubt yourself! you do just fine! 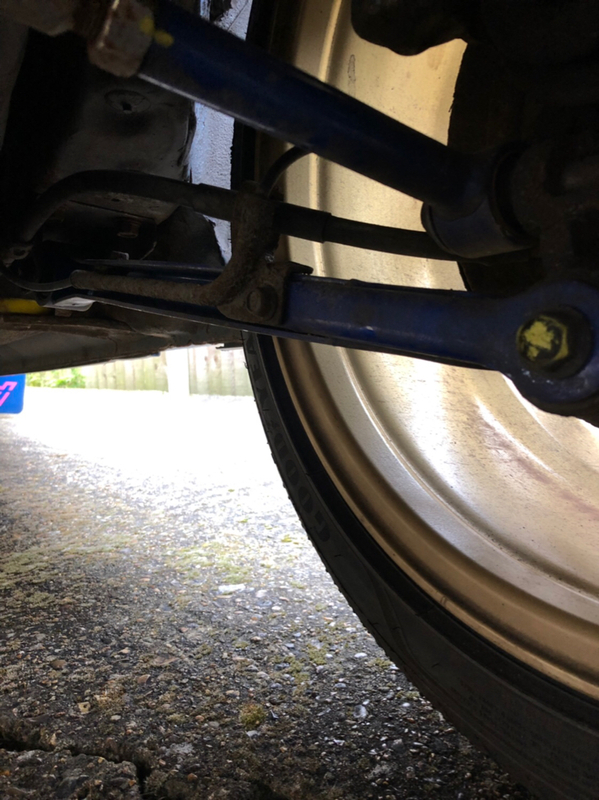 Brake stoppers make a surprising difference to pedal feel, I have an integral one with the strut brace, I remember fitting it at jap performance openday... I had to borrow 2x trolley jacks and drop the front suspension!! Don't doubt yourself! you do just fine! !